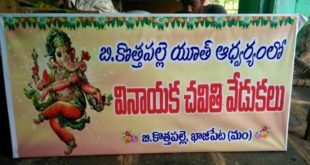 Pulivendula (Telugu: పులివెందుల or పులివెందల), the headquarters of the taluk, is situated on the road from Kadiri to Muddanur, being twenty-seven miles north of Kadiri and twenty-three miles south of Muddanur railway station. It is a fast developing town in the district with a population of more than 1,00,000. It is also famous for its local fund dispensary (Santa). The name Pulivendula is said to denote the ‘the haunt or abode of tigers,’ and may have been appropriate to the place some hundreds of years ago; but it is certain that there are no tigers nowadays in the Palakonda hills to the south of the town nor indeed in any portion of the taluk. The Pulivendula vanka, a tributary of the Mogameru, flows through the town, and a number of spring channels rising in its vicinity provide good irrigation to the low-lying fields bordering the village on the north and east, where betel-vines, plantains and other fruits, as well as flowers, are grown in some profusion. The Local Fund market (Santa) at Pulivendula is the largest of its kind in the district. It is held every Thursday in an extensive and commodious walled compound and attracts a great deal of business. Traders from Anantapur and Bellary districts frequent it, and it forms convenient link between the plateau taluks and the main line of railway at Muddanur or Kondapuram. More than hundred thousands of rupees worth of merchandise is said to be brought to the market every week, mostly in the shape of various grains, cattle and country cotton goods. It is a peculiarity of Pulivendula town that its principal temple (Ranganatha) is situated a mile away to the west in the midst of the fields. In spite of this, daily worship is conducted, and some thousands of people attend its two principal festivals, at one of which, the Pavithrotsavam, which lasts three days, a colonnade of bamboos decorated with flowers is erected from the mida vigraham to the gateway of the temple. There is a ruined fort on a small hill above the town, a reminiscence of the political ascendancy of the poligars, which is especially characteristic of this part of the district. Pulivendula was subject to the poligars of Vemula. On Aug. 23, 2007, the Cabinet Committee on Economic Affairs (CCEA) gave its approval for setting up of a uranium mine and processing plant at Mabbuchintalapalli-Tummalapalle, about 15 km south of Pulivendula, at a total cost of 11.06 billion rupees ($269.9 million). The plant will be set up by the Uranium Corporation of India. Foundation stone was laid on 20 November, 2007 by Dr Y. S. Rajashekar Reddy, Chief Minister of Andhra Pradesh. The mine is likely to be commissioned within 30 months and the processing plant in 36 months. 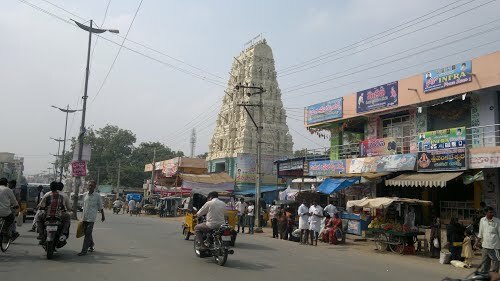 Pulivendula is well connected by Road to all parts of the Kadapa district. Can I get the telephone directory of Pulivendula? Hi there, nice site with good info. I really like coming back here often. There’s only one thing that annoys me and that is the misfunctioning of comment posting. Good.Go ahead with Handy scenarios in present days. Sai Praneet, We consider your request and will notify our editorial team on the same.